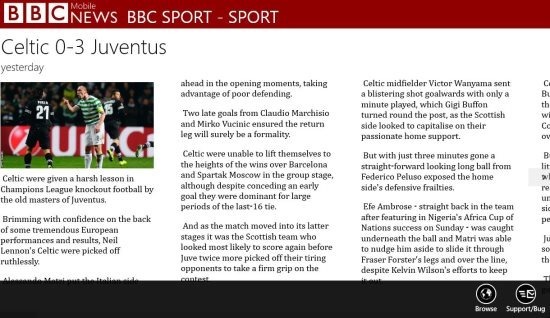 BBC News Mobile is a good free Windows 8 news app. Keep yourself updated on the latest and hot news, from the famous news channel BBC news; using this app. BBC News Mobile is a third party app; i.e., it’s not an official app. The interface and everything looks just like the official BBC News. The app also has got good ratings and it works fine. This app displays all the latest news and highlights from the BBC news. This app requires an internet connection to feed the news. The BBC News Mobile is a good news app. You can view the recent happenings and breaking news published by BBC news using this app. 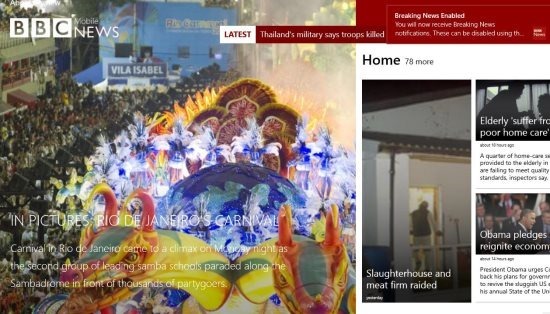 The live tile on your Windows 8 start screen also displays the breaking news; to view them instantly. Let’s see more details about the interface of this app. The home screen of the app looks as shown above. You will see beautiful pictures captured by BBC reporters. Click on them to view more photos. Now scroll on the main page to view categories of news like: home, most popular, technology, games, etc. On the top of these sections, you can view the latest news headlines. Click on the category name and you will view more news related to that category (like shown below). Click on any news and you can read the full article on it as shown below. If you want to navigate to the main of page of that BBC news, then right click on the screen and choose the browse option. And if you find any bug, click on the report bug option to report it to the app developer. This BBC News Mobile app is free. The live tile of the app displays highlights on your Windows 8 start screen. Get the latest BBC news in this app. Read full articles in this app. Use this news app in snap mode also (as shown below). Use this link in Internet Explorer of Windows 8. Use the View option to navigate to the Windows Store App of your Windows 8. Download and install the app from the store app itself. 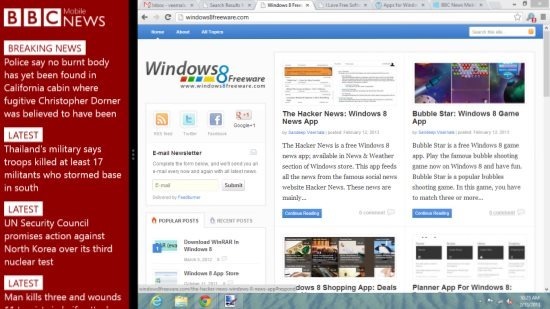 Also try other news app like: 4 News App for Windows 8 or Intel News app.